Bedroom 4.Double bed, roof terrace and cosy snug with TV/video, en suite (first floor). Comfortably furnished lounge with sofas, satellite TV (limited channels)and DVD player. The villa enjoys extensive split level terraces to the front with sheltered BBQ area on the upper level and an attractive hourglass shaped swimming pool with waterfall on the lower terrace. Villa Eileen is in a quite residential area close to the a short walk from the Las Cucharas beach. The resort is situated on the coast in the central part of the island, Costa Teguise is one of Lanzarote&apos;s main tourist resorts. It is only a 20 minute drive from Arrecife airport and is a convenient place from which to explore the islands tourist and Cultural attractions, as well as the northern fishing villages of Arrieta and Orzola. The island&apos;s historic capital of Teguise is a 10 to 15 minute drive away and provides a welcome break from the hustle and bustle of Costa Teguise, unless of course you go on a Sunday, when the market is in full swing. 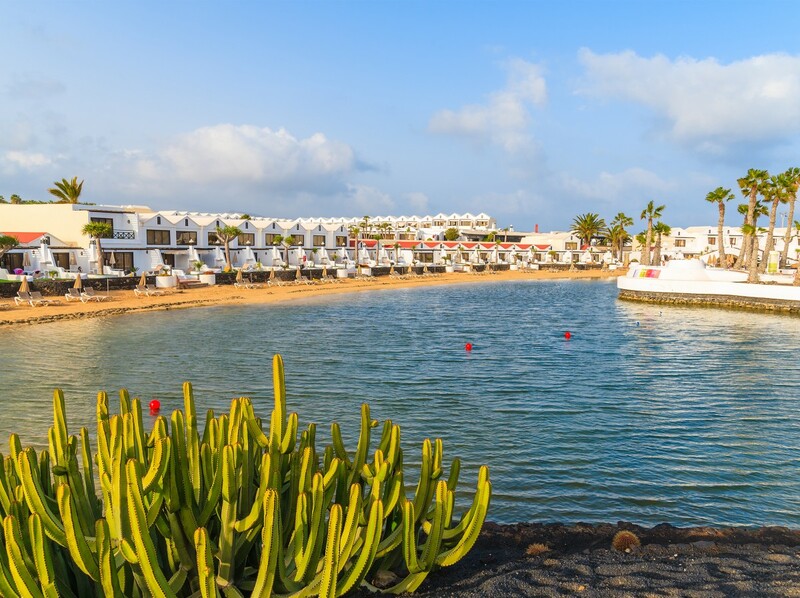 Costa Teguise is well situated to explore the many tourist attractions in the North of Lanzarote, such as the Cueva de los Verdes, Jameos del Agua and the Jardin de Cactus. Windsurfing, as mentioned before, is a major pastime in Costa Teguise with visitors and residents alike. There are windsurfing schools, shops and equipment rental companies clustered around the beach at Las Cucharas. Most levels of experience are catered for, from Absolute beginners upwards. Cycling and running are also quite widely enjoyed for the more energetic amongst us, the balmy climate and safe roads making for a very pleasant experience. Costa Teguise has established Golf course so this is where you need to head for eighteen holes in the sun all year round. There is also a water park and a selection of diving schools Like most of the resorts on the island, Costa Teguise nightlife could be classed as lively but not rowdy. Restaurants are open until late and there is a good selection of bars, both British and local style, in the resort. This resort set on the eastern side of Lanzarote, has a stretch of pale soft sand, its beach is perfect for swimming and windsurfing, above the beach you will find a excellent line of restaurants and bars, with a variety of good souvenir shopping, supermarket and boutiques. At night Costa Teguise heat&apos;s up to offer you live entertainment bars to keep you up into the early hours.